Community Activity: Meetup, meetups, and more meetups! You must register to attend the Giant Jamboree before the August 31 deadline to secure your presentation slot. Experience iGEM and be a part of the excitement as we celebrate your team, your hard work, and your achievements. Join us at the Jamboree! Make sure to register by the August 31st deadline to secure your poster and presentation slot. At least one team member must register for the Giant Jamboree by the August 31 deadline to secure your team's presentation and poster slot at the Giant Jamboree. To avoid a late fee, ALL team members should register by August 31. Telling your story clearly and concisely is an important part of your iGEM project. Your wiki should not only be used to document your work, it is your platform to communicate your message to the general public. It takes time to tell us about your work, the importance of the problem you are attempting to solve, why you have chosen this approach, and all the work that you've done. Give yourself that time by starting to work on your wiki now. It's all about story telling and we look forward to hearing your story. Just One Giant Lab (JoGL) did an in-depth analysis on wiki editing's impact on team performance. Learn more about the impact that wiki editing had on team’s projects by viewing the “waterfall”. The iGEM Collaborations page is the central place to share information about your work and help you connect with other teams. We have updated the Medal Requirements this year to include team collaborations as a silver medal requirement. If you’d like to make a post, please email the relevant information to hq AT igem DOT org and we can post it for you! FREE Modeling software, Cloning kit, & DNA available to teams! Did you know that Modeling is a Gold Medal criterion? Mathworks is generously offering a modeling software kit designed for iGEM teams that includes 12 products. Also make sure to check out: the SureVector Next-Gen Cloning Kit from Agilent, and free DNA synthesis from IDT. Visit our Special Offer page for a complete list of special offers and details. We are looking for volunteers to help us make the 2017 Giant Jamboree an amazing experience for all! If you can commit to at least 2 days between Wednesday, November 8 to Monday, November 13 and can be in Boston, Massachusetts, apply to be a Volunteer! The deadline to apply is August 31, 2017. Please note, this opportunity is open to iGEM alumni and other non-team members only. If you need a travel visa in order to attend the Giant Jamboree, apply for this now! The time required to process these applications can vary widely and may take months. Your best chance of a successful application is to apply as early as possible. Visit the Visa Help page to learn more about travel visas and iGEM's visa invitation letter system. Meetups, Meetups, and more Meetups! We are delighted to see a total of 14 meetups scheduled for July and August. 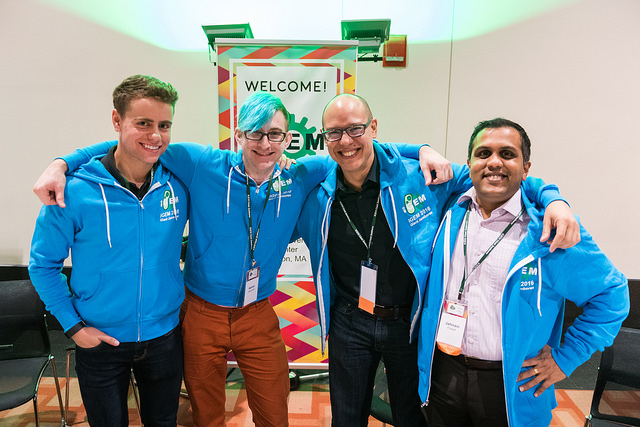 What an amazing expression of iGEM spirit and your commitment to connecting with the community! Want to attend a meet up? Visit the iGEM meet page to learn more.